The guidebook warned of timber rattlesnakes lingering throughout the cienega (a hanging marsh high in the mountains). 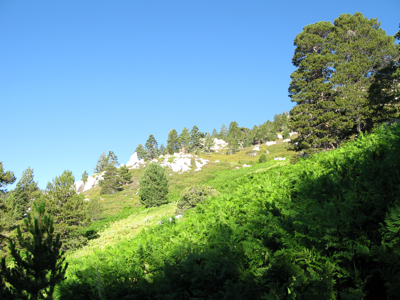 So as we step off the trail at 8 am, I look around cautiously, and make a good bit of noise to warn the high altitude serpents of our arrival. I’m on another adventure with my brother that has me wide awake at an unfamiliar hour. We’ve already hiked five miles since dawn. But this juncture at the cienega signifies the moment when we step off the well-worn trail (which provides fast and easy hiking), and onto paths lightly marked by small stone cairns, if marked at all. 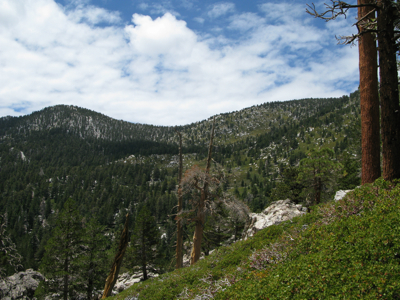 My brother takes the lead, though we soon leap frog past one another, each thinking that we’ve discovered the path of least resistance towards Marion Mountain, our first of seven peak destinations in the San Jacinto Wilderness. Sneak Peak of Marion Mtn. Cross-country hiking demands constant route finding and keen observation about your immediate surroundings and the proximity of those surroundings to major formations in the area. My awareness of where we’re headed and where those snakes might be waiting, sharpens in the cool morning air. This is exhilarating. Almost meditative in our steps, we arrive at the summit of Marion rather quickly, a point we’ve both looked at almost our entire lives. 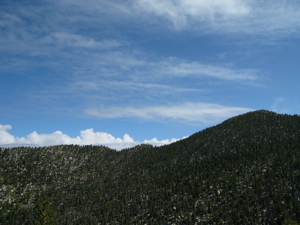 A chimney climbing scramble to its very top provides stunning views: a new perspective down into Strawberry Valley of Idyllwild below, and to the mountains where we’re headed above. We take a moment to examine the map, attempting to identify a few of our future destinations: Jean, Newton-Drury, Folly, and San Jacinto Peaks. We consult the guidebook again, glossing over additional snake warnings, and searching for insights about reaching Jean Peak. Feeling confident that we’ve appropriately identified the peaks ahead, we begin our descent and then another climb after a short distance of cross-country travel. At this point, I disagree with my brother’s chosen path. 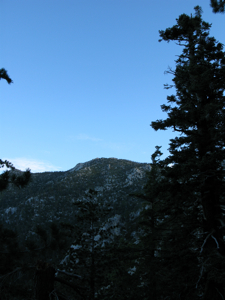 The book wanted us to stay more to the west of a rock outcropping, while he heads directly towards it. I gently mention this, but he veers farther east. Maybe he didn’t hear me. There’s no real reason to argue, as both paths will get us to the summit, and it’s likely his way will take us to the ridge line and to more views even faster. I’m right of course, about both the “right” path mentioned in the book, and the fact that my brother’s way is much more scenic. While cross-country hiking takes every participant’s effort for brainstorming and route finding, sometimes it’s best to let the more experienced hiker move forward. My brother’s instincts in these hills remain right. But at Jean Peak, we’re confused. 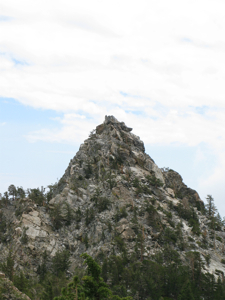 The summit directly in front of us looks similar to what we both remember as San Jacinto peak, especially with the emergency shelter sitting on its southern shoulder. We thought this was Newton-Drury. Fortunately, we soon realize our oversight: Newton-Drury sits at 10,000 feet, several hundred feet below where we currently stand. In our excitement at the top of Marion, we failed to consider all variables necessary for good route finding. In this case, elevation. The new realization confirms our path for the rest of the day, allowing us to safely learn an important lesson. Other than some thunderheads brewing, which we watch carefully to avoid a lightning storm, our walks between Newton-Drury, Folly, San Jacinto and then on to Miller, are uneventful, at least as far as anything adventurous goes. The clouds hold off, and we enjoy the beauty of the alpine aesthetic all around us. 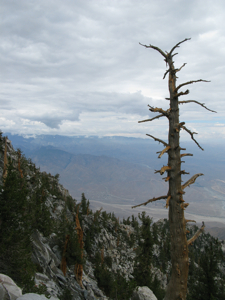 Twisting trees, jumbled rock formations, and incredible vistas, particularly the views from the sharp rock ridge between Folly Peak and San Jacinto, await us at every turn of the landscape; we breath heavily through our mountains’ prettiest wilderness. 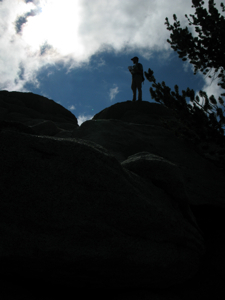 After Miller Peak, which provides another fun ten-foot section of subdued granite free climbing, we look over the map, the book, the hills and the sky. Our last peak sits out on the horizon, Cornell. And though it’s the lowest peak of the day, Cornell is the sharpest, most prominent and dramatic summit we’ll ascend. Truly a pinnacle that has me nervous. Not only does it look intimidating, but the book mentions some “airy” scrambling to the top, much more exposed than our previous climbs. We descend from Miller down a steep slope, attempting to avoid bushwhacking and twisted knees at all costs. Once we navigate around a short talus field, we run into the only other cross-country hiker we’ll stumble upon all day. He’s as surprised to see my brother and I as we are to see him. After sharing the common hiking pleasantries, he provides us with beta about our hike ahead. He’s quite knowledgeable, and the excitement on his face when he mentions the climbing section of Cornell makes me enthusiastic, and even more nervous. In a short time, we find ourselves at the base. The climb to the top is really not hard, but the exposure is airy, to say the least. 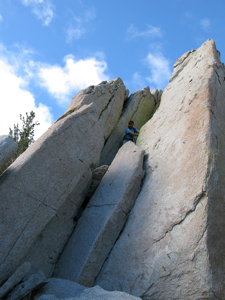 Without ropes, there’s a definite fear game I play; the tumble over beautifully metamorphosed granite and into thin air keeps me on my toes and my adrenaline pumping, even while sitting comfortably on the summit. And though we’ve climbed six peaks previous to Cornell, somehow this rocky point feels like the real summit of the day. When the adrenaline resides, I celebrate the views and our accomplishment. The weather held, we found the route, we made it all in decent time, we’ve shared another great adventure. Deciphering and explaining the feeling of standing (or precariously sitting) on top of a mountain is difficult . . . there’s really nothing else like it in the world. But reaching the summit is only half way. There’s still the down climb from Cornell, the several miles across the hills, and the final trail running back to the car. I clear my head and recognize that climbing peaks and cross-country travel is not about the destination, it’s the ultimate meditation on being in the moment, on enjoying each footstep. I get jolted back to this concept of the present moment when we reach the cienega at 2 pm, six hours after beginning our cross-country trek from this very spot. We’re moving fast, downhill, excited, chattering about the day and the hikes we might do the rest of the week. My brother suddenly stops. I run into him. “Check that out,” he points ahead five yards where a large timber rattlesnake quintessentially slithers across the trail, its black body glowing and warming in the sun. Without saying a word, I know our thoughts are the same: we’re not cross-country gods, but mere mortals walking beneath mountains that are far more powerful than us. The snake disappears into the meadow up hill. “On the count of three,” my brother states, “I think we should skirt to the left and run by together, as fast as we can.” Considering there could be other snakes nearby, and that the one we just saw is moving uphill, away from the trail, it’s about our only option. “One, two . . .” on three we’re both at a jumping sprint hooting and hollering, I’m screeching like a five-year old actually. I hear our rattlesnake friend purr after us, surely feeling the vibrations the heavy steps make on the ground. Slowing to a quick jog, we jog none-the-less, enjoying every moment until we reach the car an hour later. This entry was posted in At Home in California, Different Modes of Exploration, Running, Travel and tagged Cienega, Cross-Country San Jacinto, Idyllwild, San Jacinto Peak, Seven Summits of San Jacinto, Timber Rattlesnakes, Trail Running. Bookmark the permalink. I love this post, Matt! I think I missed that you guys ran into another cross country hiker out there. Sounds like a great day in the mountains! And I very much enjoyed reading about your adventure! You mean the rattlesnake? It’s funny how few people were out there. It was a stunning day. Glad you enjoyed!